After all the buzz about purple fringe on this camera, I was a bit concerned as I began taking pictures with my Sony DSC-F828 in early January of '04. Now it's Mid-March, I've taken it a third of the way around the world and shot close to a thousand photos with it, and precisely ONE had even the tiniest purple fringe. What's more, the fringe ENHANCED that backlit photo. My personal theory is that Sony managed to improve the camera between the time the first review samples went out and when mine was built. On a recent trip lots of great and costly cameras were in heavy use by fellow travelers, including the new Canon Digital Rebel. So far as I could tell, none of those cameras got better pictures of that trip than the Sony, and most of them had to worry a lot more about dust and water, due to their interchangeable and add-on lenses. My one caution is that you can't use the 30 FPS movie mode with CompactFlash memory. That is only allowed with MemoryStickPro memory or a Hitachi CompactFlash hard disk. If that matters, get LOTS of memory, as even 15 FPS used over 100 MB in 5 minutes. Update: A useful firmware upgrade has since become available at Sony's web site. Bang for your thousand bucks? A resounding yes! (i) Go to www.neatimage.com & download this Noise Reduction Software for free. Yes, freeeee!!! I'm using it for ALL my images now! - Even Photoshop or JASC Pro 8 doesn't have it! (i) I have placed an order for 828's Circular Polariser. I believe it will help out, as recommended by some of the guys here. Thks! (ii) Dial up Aperture Priority & keep your aperture range between f4-f8 & you will see results! Frankly speaking, for 1000 bucks you can't get a PACKAGE like this! I will be getting the Nikon D2X with all the cool lenses later (to fulfill the super high-end photo-requirements), but as for the ALL IN ONE semi-pro job, this is the real-deal! (i) By the way, I can't find a pro lens that can do f2-f2.8 for 28mm to 200mm. There is nothing like it. Period! (ii) Nobody takes NO-Light shots(eg. Singapore Night Safari- candle light brightness!) better than Sony. Ask the pros! I was apprehensive about this camera due to the talk of purple and other 'problems'. I've been using this camera now (july) since May and I've not had any weirdness or problems. 4. I love the way I can combine media and flip between compact flash and sony stick. Sony DSC-F828 Review: 1. Introduction: Digital Photography Review. Detailed review of Sony Cyber-shot DSC-F828, with actual sample images, and a detailed data sheet. Is Sony DSC-F828 the best digital camera? Cyber-shot DSC-F828 Sony : The new SONY DSC-F828 will amaze you with its swiftness of reaction and its high quality picture results. 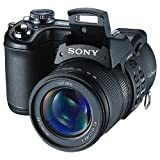 Sony DSC-F828 8MP Digital Camera with 7x Optical Zoom.